41076 Farran and the Crystal Hollow is an Elves set released in 2015. This is a description taken from LEGO.com. Please do not modify it. 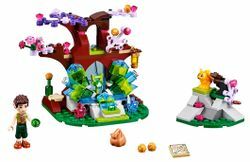 (visit this item's product page) Dodge flying acorns with Farran as he collects the earth key on the LEGO® Elves’ quest! Follow the map with Farran Leafshade, the Earth Elf, to a secret hollow in the forest. He knows that in this magical place he will find the earth key, which will help his new friend Emily Jones get back home to the human world. But one very protective squirrel, Miss Spry, stands in his way and is firing golden acorns at him with a catapult! Help him take cover and try to show Miss Spry that he is friendly by helping collect up the acorns to store them for later. Now Farran can use his magical earth powers to explode the crystals obstructing the entrance to the cavern and collect the earth key. Includes Farran Leafshade mini-doll figure plus Miss Spry the squirrel. Farran uses a map to find the secret cave in the forest. Farran knows that he can find in this magical place that will help his new friend, Emily return home to the world of men. This set was discontinued in 2016. Facts about "41076 Farran and the Crystal Hollow"
Dodge flying acorns with Farran as he collects the earth key on the LEGO® Elves’ quest! This page was last edited on 22 January 2016, at 14:55.